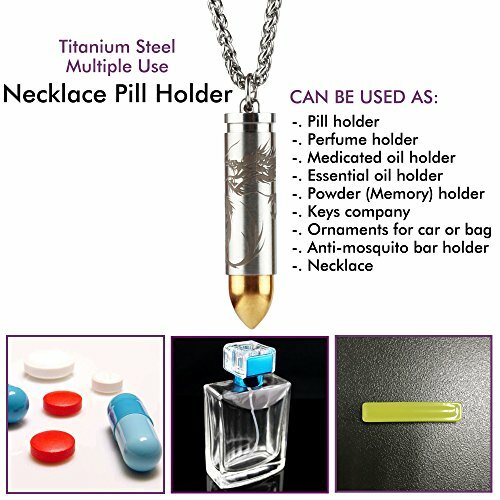 - Used as EDC pill container, but more like a pill reminder, ornament vessels, necklace pendant; broad utilities than just a pill container. - FDA grade titanium steel complies with ROHS, non-toxic, high durability on strength & corrosion resistance. - A real healthy product to keep away odd smell, allergies, bugs, faint and headache. - Finely milled threads with matte surface give it smoother open and close for your daily use. - Un-squeezable O-Rings are used with waterproof for 30ft, safe to keep your pill during shower, swimming or even free diving. - Suitable for people who like adventures outside with emergency use of pills, camping & working at night (like drivers) outside with bug or mosquito free; who work under pressure with faint or headache; who want to memorize the most important thing in life, like veteran can wear it with nameplates; who need to take medication every day like patients of hypertension, glucopenia, Parkinson and so on. 1. The tip chamber is not waterproof because it's mainly used for liquid perfume, essential oil, medicated oil or solid anti-mosquito bar that the smell needs to be spread, the sealing can not help with spreading. 2. All parts are cleaned by ultrasonic before leaving factory, but this is an industrial product and the inside may be contaminated with dirt, especially in threads or bottom of this container, it's necessary for you to use alcohol to clean the chamber for pill with brush for your own health. - 1 x Ti Pill Fob. - 1 x 3.5mmx25" Stainless Steel Necklace Chain. - 1 x Solid Anti-Mosquito Bar (can be cut for 3-4 times using). - 2 x extra O-Rings. - 1 x Bag of Cotton for Essential or Medicated Oil. - 1 x Gift box. BRIEF INTRODUCTION: Multiple use pill holder, container, fob with 2 chambers - 1 is for pills at back and another is used for drops of liquid essential oil, perfume, medicated oil or solid anti-mosquito bar (Cut to fit into tip chamber). The main body material is FDA titanium steel with brush finish and gold PDA plated at tip, harder to withstand potential scratches. 3.5mm x 25" stainless steel 316L necklace & keychain & anti-mosquito bar & extra O-Rings are coming free. WIDELY USED: Used with keys(Men&Women), necklace pendant; kept in pocket & bag with small pills or capsule or memory item need to take with you daily; wore or hung in your car, office or home to drive mosquitoes & bugs with 100% harmless anti-mosquito bar provided; made some drops of perfume or essential oil to the tip chamber to kill the odd smells which may make antipathy to you; made some drops of medicated oil to kill your faint or headache if you are under pressure or night workers. FABULOUS WORKMANSHIP: Deburr all sharp edges before finishing and plating to avoid potential cut during your daily use with unsurpassed quality control. A special designed coil dragon tattoo is lased onto the surface, which makes this pill fob more like a ornament vessel that you definitely would like to carry or wear it every day - what a pill reminder! The engraved dragon and brush finish with finely milled threads give smoother open and close. SIZE & CAPACITY: Overall size of this pill holder is 0.44 x1.929", total weight is 0.6 OZ with thick necklace; the inner size for pill at back is 0.33x1.16" with capacity 1.65ml and inner size for front tip is 0.6x0.55" with capacity 0.45ml. This pill fob is good to fit 2-3 capsules or round pills under 50ug (diameter not exceed to 0.32") which can fit 5-9PCS depending on the thickness of pill. You can refer to below for a demo video for how many pills it can be contained. WARRANTY: We devote ourselves to make the best products and provide the good service to every valuable customer - || 1 Year Unlimited Warranty || 100% Satisfaction Guaranteed. If you're not thrilled, simply contact us at 2960207227@qq.com and we'll replace your item or process a refund, you will be taken care right away. *VOLUME DISCOUNTS ARE ALSO AVAILABLE* (See "Special offers and product promotions" at sections below this). If you have any questions about this product by ANO, contact us by completing and submitting the form below. If you are looking for a specif part number, please include it with your message.